and that style just sold-out. 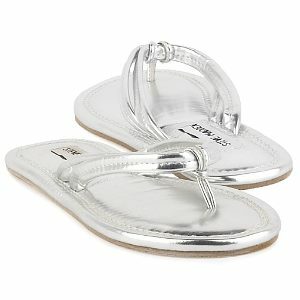 - "These particular style of sandal made by Steve Madden are the BEST! I found them several years ago and they instantly became my favorite! I wear sandals 8-9 months out of the year and these hold up remarkably well. The bottoms wear out because they're so flat, but I just get them resoled. The leather is very soft and have never rubbed a sore or blister. The inside foot bed is very puffy and comfy too! I wish SM would make these again in lots of fun colors. These sandals are very much worth the price! I wear these sandals exclusively with capris, jeans and shorts." Own these shoes? Write your own review. About Steve Madden: Founded in New York City (Brooklyn) in 1990, Steve Madden shoes continue to delight the most sophisticated young fashion divas. Regular design ideas from customers helps Steve Madden stay one step ahead of the latest trends, with a perfect balance of funk and style. Sold in fine department stores. Located at 529 Broadway in New York City. Details: Women's Steve Madden *Karibean* man-made thong sandals. Decorative knot and needle stitch detail. Decorative straps. Open toe design. Cushioned insole. Non-slip, man-made sole.